Anemia is a medical condition characterized by a lack of healthy red blood cells and/or hemoglobin inside them. Hemoglobin, a major part of the human red blood cells, is a protein that binds oxygen and transports it throughout the tissues in your body. 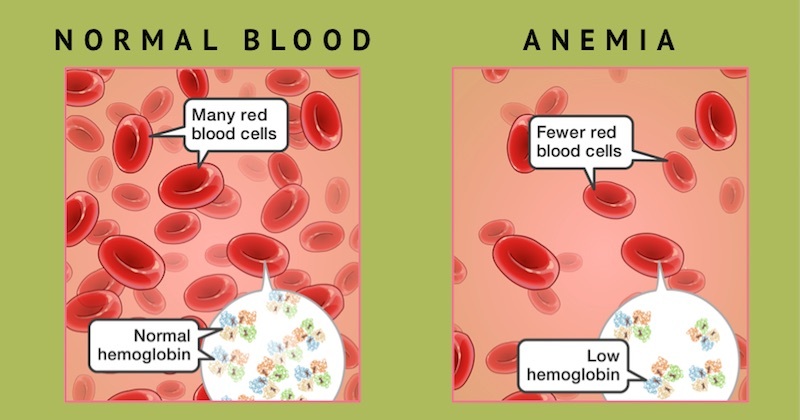 So, generally speaking, if you don’t have enough red blood cells and/or hemoglobin, the organs and tissues in your body don’t get enough oxygen—and that’s what’s anemia is all about. To determine if you’re anemic, you’ll need a complete blood count test to check your hemoglobin level. The normal threshold is considered to be 120 g/L (12 g/dl or 7.4 mmol/l) for adult non-pregnant women and 130 g/L (13 g/dL or 8.1 mmol/l) for adult men, according to WHO reference values. Technically, any number in between the normal threshold and 110 g/L (115, for example) is not considered to be anemia yet, but it’s a huge red flag to look into. In 2015, about 2.36 billion people worldwide (roughly a third of the world’s population at that time) were living with some degree of anemia. So, all in all, the condition is extremely common—but that doesn’t mean it’s a harmless and minor one. When left untreated, it can cause severe irreversible damage to each and every structure in the human body. Lack of crucial nutrients: For example, iron, folate, and vitamin B12 are components that are absolutely necessary for the proper synthesis of red blood cells and hemoglobin. Toxic damage: Some drugs (medications) can severely inhibit the production red blood cells. Methotrexate, for example, is a medication that is widely used for the conventional treatment of autoimmune diseases. Heavy metal toxicity is another toxic cause of anemia. Eating highly processed foods or foods with artificial additives on a regular basis will also contribute to impaired production of red blood cells. Congenital disorders: Some hereditary conditions, like thalassemia or aplastic anemias, also lead to hemoglobin deficiency. At the time being, there is no confirmed and failproof treatment to most of these illnesses, as they are “encrypted” in one’s genes. But it is in our power to support the blood system as much as possible to prevent complications and improve quality of life! Blood-destroying toxins: This includes such conventional medications as cephalosporins, diclofenac, oxaliplatin, fludarabin, and dozens of others! (ALWAYS make sure to carefully read the list of side effects of what you decide to take). Some animals, fishes, and plants also produce hemolytic toxins. Autoimmune and congenital disorders: There are many health conditions in which your body starts triggering its own red blood cells and destroying them by the score. Just to mention a few: autoimmune diseases (like autoimmune hemolytic anemia), others are congenital (like hereditary spherocytosis), but all of them need your full support and careful attention. Restore the balance in your body to alleviate the course of these diseases as much as possible. Infections and medical procedures: For example, malaria is an infection of the blood during which a bug from the Plasmodium family starts infecting the red blood cells directly and ripping them from the inside. Some medical procedures such as hemodialysis are also accompanied by a certain degree of red blood cell destruction. In some cases, the impact of this can be truly life-threatening. Severe bleeding of any kind instantly results in anemia. Women who menstruate are more prone to blood loss. If iron intake and absorption does not replace the iron lost during your periods, you can end up with iron deficiency anemia. As a rule, a blood loss of up to 15% (about 750 ml) of a person’s total blood volume does not result in any anemic symptoms and does not require urgent treatment (unless the person has already had anemia before the bleeding), but every human body is unique—so it’s important to stay alert and double-check everything in case of doubt. Iron deficiency anemia: Mouth sores, spoon-shaped nails (koilonychias), an inexplicable hunger for strange and inedible substances such as chalk, wood, dirt, ice (this is known as pica). B12 and/or folate deficiency anemia: A sensation of tickling or numbness in the extremities (paresthesia), easy bruising and bleeding, inflammation and soreness of the tongue, gastrointestinal symptoms. What Happens When Anemia Goes Untreated? Central nervous system: Among all organs in your body, the brain is among the most sensitive to hypoxia (decreased oxygen delivery) that’s caused by anemia. As a result, it starts working much less effectively—impaired memory, focus, and learning potential are the most common signs. If the anemic state persists for a few years, the cognitive damage might even be irreversible. Cardiovascular system: To compensate for the lack of oxygen, the heart starts beating much faster and stronger, often increasing the blood pressure. After a few months of working in such a fashion, the heart starts to enlarge, which is an irreversible process that makes this organ much more likely to be affected by all sorts of diseases including coronary heart disease. Endocrine system: When the endocrine glands in your body receive less oxygen than is needed for their proper function, virtually any kind of hormonal imbalance becomes much more likely. Immune system: People with anemia are much more likely to catch any kind of infection because their immune system is weakened by the chronic lack of oxygen. Their wounds and traumas heal much slower as well. Pregnancy complications: Severe anemia during pregnancy is associated with poor development of the baby and puts under great risk, both the baby’s and the mother’s life during labor. As a rule, anemia is tolerated better by people with high blood pressure, at least in the short run. This is because the hypertension becomes a compensating factor: If there’s not much oxygen in 1 ml of blood, let’s pump MORE MILILITERS per minute thanks to an increased heart rate and blood pressure! The good news is that the whole process of heart enlargement takes months, even years—so there is a lot of time to alleviate both conditions or even cure them for good before it’s too late. This combination is extremely dangerous for life. There isn’t enough oxygen in the blood due to anemia—and no compensation coming from the cardiovascular system, leaving the body with no means to nourish its tissues. As a result, a serious infection or trauma can easily be lethal for the person suffering from both of these conditions. The vicious cycle is really nasty: Cancer causes anemia ⇒ anemia weakens the body ⇒ the body has less energy to fight the cancer ⇒ cancer progresses and worsens the anemia. Addressing a single part of this problem won’t be enough. You have to treat BOTH sides of the equation to overcome the challenge and achieve a truly vibrant state of health. 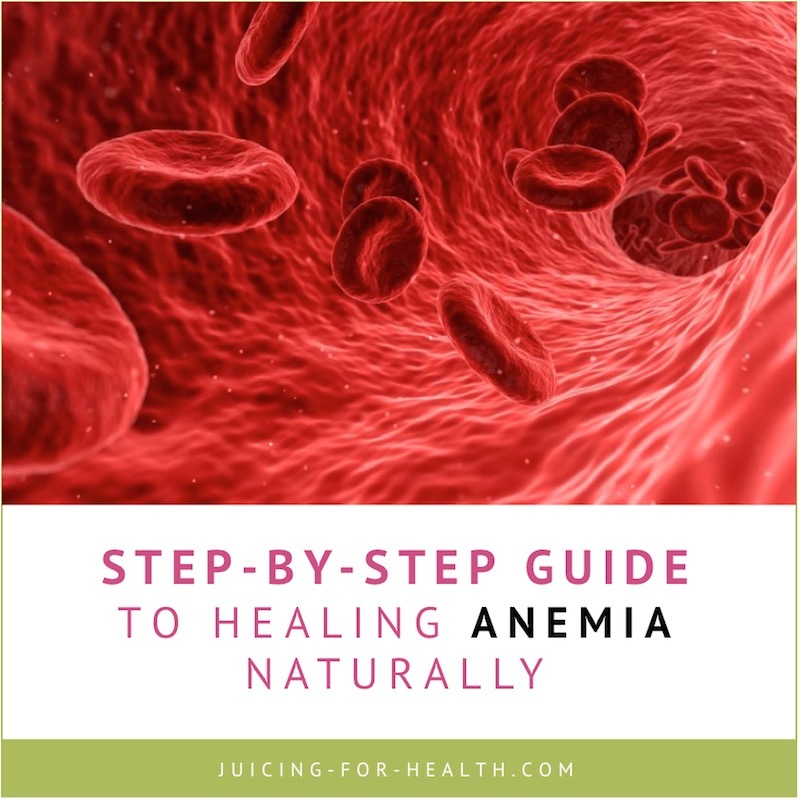 If you have a confirmed anemia diagnosis, here’s a short list of steps that will significantly speed up your recovery to bliss, the natural way! A poor digestive health is the beginning of many health conditions due to malabsorption of many nutrients. Most likely, you also have low stomach acid that prevents proper absorption of nutrients such as iron and the B vitamins that lead to your low/poor production of red blood cells. A good place to start healing anemia is to give your body a “reset” by doing a gastrointestinal cleanse that will help your small intestines to start being able to absorb nutrients again. A parasite cleanse may also be necessary as parasite and fungal infections often cause anemia. These two cleanses should really always go hand-in-hand. If you also have candida, read this candida protocol. On the second week after you start the gastrointestinal cleanse, also add digestive enzymes into your routine to help you improve your digestion. Eating fermented foods such as sauerkraut, kimchi and coconut kefir provides natural probiotics for a healthy gut. These microbes help heal the gut lining, absorb nutrients much better, reduce inflammation and strengthen your immune system. When you’re on long-term medications, eat highly processed foods that are high in the wrong fats and sugar, chances are you’re deficient in many nutrients. Not only are these nutrients depleted in nutrients, your body also expend nutrients to digest them, causing further nutrient deficiencies. Some medications will also lower your stomach acid (see #1 above) thus it impedes your digestion and reduce nutrient absorption. When your body is not absorbing nutrients that it needs for synthesis of red blood cells/hemoglobin, you become anemic—simply due to poor choices of food. While drinking alcohol in moderation is fine, drinking excessively may lead to deadly health consequences. Excessive drinking can lead to suppression of red blood cells synthesis. In heavy drinkers, alcohol anemia can occur in various ways, often as a side effect of liver cirrhosis. With alcohol in the blood system, it prevents folate from functioning in blood-building as it should, putting the drinker at risk for alcohol anemia. Avoid drinking green tea if you are anemic. Drinking green tea in large amount can interfere with iron absorption. The polyphenols in green tea can bind with iron, inhibiting its intestinal absorption, and also prevent assimilation of vitamin B12—two very important components for blood-building. This one might sound counter-intuitive but it works when you do it right. Studies indicate that moderate aerobic exercise is quite beneficial even for severe states of anemia, so start moving! Do it bit by bit, step by step, gradually increasing the level of physical activity. Don’t strain yourself: your goal is NOT to build muscle or lose weight but to stimulate your body into speeding up its processes—hemoglobin synthesis included. Iron deficiency anemia: Liver, grass-fed beef, spinach, seafood, nuts, beans, fortified grains. Combine these foods with vitamin C to improve iron absorption. B12 deficiency anemia: Fish, poultry, dairy products, fortified cereals, algae (spirulina, chlorella, kelp). Great for all types of anemia: Aim to get enough proteins so that your body would have enough “building blocks” to produce hemoglobin, a protein itself. But don’t stop on just those 3 nutrients (iron, B12, proteins)—aim for a well-balanced and nutrient-dense diet based on all-natural products. Your body is a delicate machine carrying out hundreds of intertwined processes at the same time—and you never know for sure which one of them will affect the other. Flood your system with what it needs and allow your body to use all the right foods you’re feeding it, to correct itself, restoring your blood count to its optimal level. Green juices and smoothies are one of the easiest way to do that. Green vegetables are rich in chlorophyll and that our body can easily use to convert into hemoglobin. Read more about vegetable juicing here. 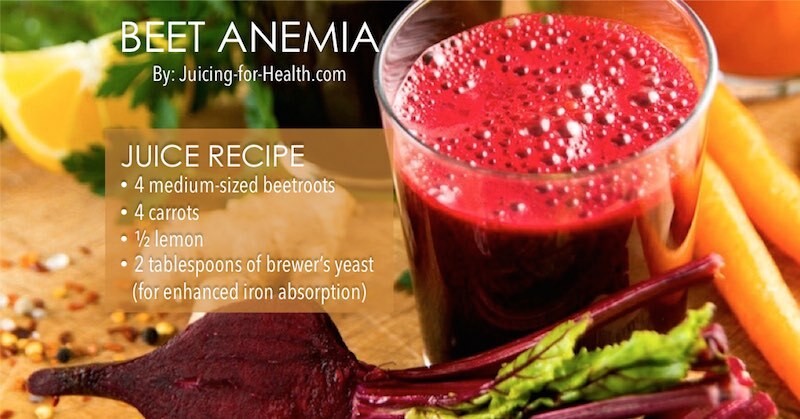 This juice combo is great for blood-building if you are experiencing iron deficiency anemia. Beetroots and carrots have blood-building properties, and the presence of vitamin C and bioflavonoids (peel) will enhance the absorption, making the nutrients more bioavailable for your body to use them efficiently. If you’re severely anemic, it makes sense to supplement with iron to help restore the iron depletion back to normal as quickly as you safely can. If eating foods and drinking juices high in iron is an issue for you, for whatever reasons, supplementing with iron may be a good option. However, most iron supplements prescribed by the doctor or at the pharmacy may cause side effects such as an upset stomach, or constipation. Synthesizing new blood takes a whole lot of resources and energy, so make sure you get enough of both. The previous steps focused on the resources part, this one takes care of the energy. Sleep at least 7 hours each day. 8 is even better. No exclusions. Avoid toxic relationships, tasks, and places at all costs. They aren’t worth it, especially now. There are some conditions that are heavily associated with anemia, so you won’t be able to heal the latter without treating the former. Get yourself checked for underlying conditions and address them immediately. This website has a wealth of information that you can use to remedy almost any ailments. There isn’t a single living cell in your body that does not need oxygen, so it’s absolutely understandable why anemia can have such serious consequences. Even though it doesn’t have any symptoms on its mild stage, never underestimate this condition and address it as soon as possible!